This hybrid controller inverter is integrated with pure sine wave inverter and PWM controller inside, adopts one CPU control technology and avhieves the free communication between inverter module and controller module. The independent modularization design improves the reliability and extendibility greatly. 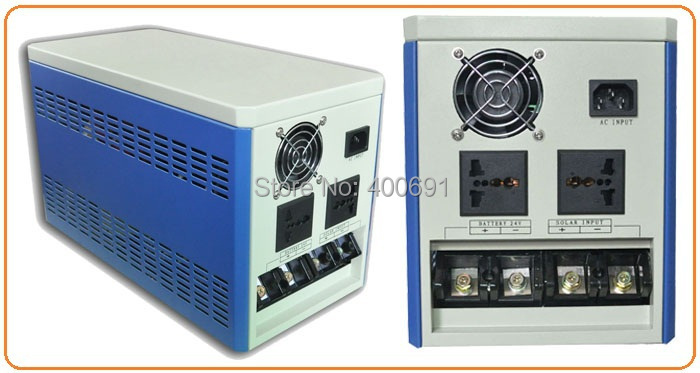 This product has various kinds of functions such as strong shock proof, solar/ grid/ battery complementary, automatically battery charging& monitoring, auto-selection to the work mode, AVR (Automatically Voltage Regulation) function, etc. It can meet the request of Various Users. >> The listed parameters above are the standard configuration. If you have special requirements of this machine, we can customize it to you. >>For example, we can expand the voltage of this hybrid controller inverter to be 12VDC, 48VDC, 72VDC, 96VDC, 110VDC and so on. 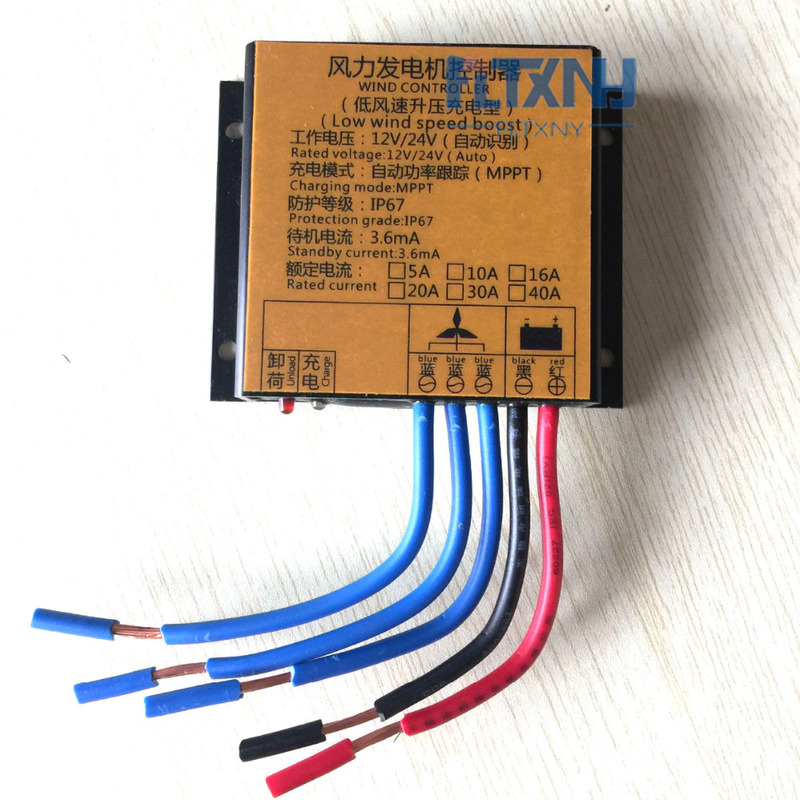 >>We also can replace the PWM controller as MPPT controller if you need. 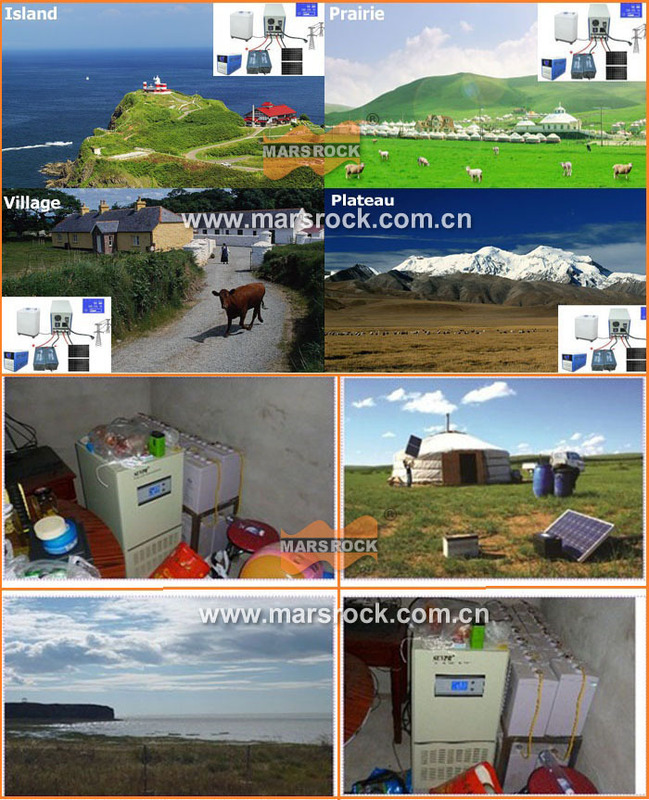 >>Solar energy, battery and utility power complementary function. The hybrid controller inverter can automatically recognize and choose solar power, utility grid or battery inverter working modes. 1. when the sunshine is adequate, the hybrid controller inverter can transfer the solar power to the loads directly and it also can charge the battery at the same time. 3. When there is no sunshine totally (such as at night or at rainy day), the hybrid controller inverter will automatically switch to choose battery power to supply the load. >>Automatically recognize PV priority model or AC priority model. 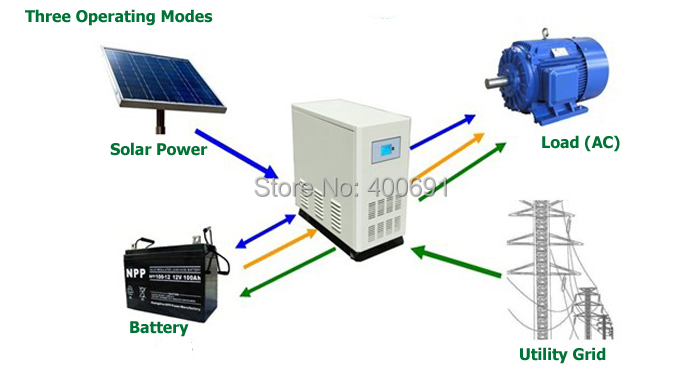 The hybrid controller inverter is with automatically recognize function. At day time, it automatically switch to PV priority mode, charging the battery and supplying power to loads. At night time, it automatically switch to utility grid priority mode. Utility grid priority to supply power to loads and automatically detect the battery status to decide whether charging the battery or not. 1. When sunshine exists and battery is full of power, the hybrid controller inverter can automatically choose inverter mode, transfer solar power to the load directly and detect whether battery should be charged or not. 2. When sunshine exists but not adequate and battery is full of power, the hybrid controller inverter automatically switch to use solar power and batter power to supply loads at the same time. 3. When sunshine exists but not adequate and the battery power is under normal level, utility grid will supply power to the loads, solar power will charge the battery. 4. When sunshine exists but not adequate and battery is lower than normal level, utility grid will supply power to the loads and will charge the battery with sun power together. 5. When sunshine doesn\'t exist and the battery is lower than normal level, in order to protect the lifespan of the battery, utility grid will supply the power to loads and battery at the same time. >>Self-recovery, unattended operation function and all-around protection. >>Wide input voltage and frequency range, full AVR. 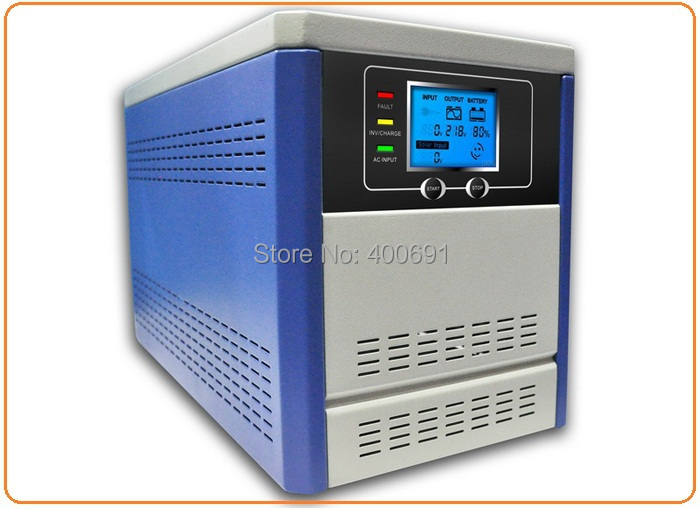 The hybrid controller inverter is with AVR function. When the voltage of utility grid is between 140-280V, the machine can make the output voltage to be 220VAC constantly. >>Continuous, standard and stable pure sine wave output waveform. Adopting ATE automation testing facilities; 480 minutes aging testing to make sure the product with super stability. Because of the good performance and high stability of this product, it can apply in many places and meet many customers\' requirements. In order to make sure our customer can get the product safety, the machine will be packed by woden carton per each one. You can have three purchasing schemes with this product in our company. 1. You can take only the hybrid controller inverter machine from us. If you have solar panel and battery already at your place, you can use it directly. Or you can match the battery and solar panel at your local place after you take this machine from us. 2. You can take the hybrid controller and solar panel from us. We can supply top quality solar panel to you with very competitive price. In order to make you more convinient, we even can left the space in the hybrid controller so that you can put the battery in that case if you need. 3. You can take the whole system from us, the hybrid controller, solar panel and battery. If your quantity is large, we will be very appreciate to supply the whole system to you. It is also more economical for you to take all products from one supplier because we can give our best price to you. 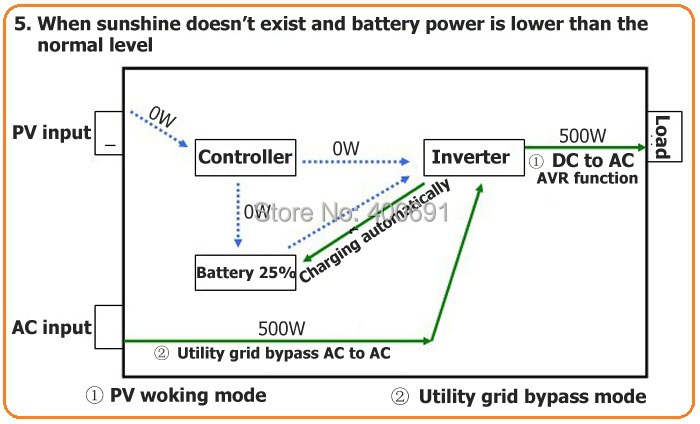 Hybrid controller inverter is integrated with an off grid inverter and a controller inside one machine. You can take this machine directly to your off grid system instead of an inverter and a controller separately. 2. Is this machine with other input voltage and output voltage? Yes, this hybrid controller inverter has power from 400W to 6000W, in each power, it with 12VDC, 24VDC, 48VDC, 60VDC, 72VDC, 96VDC, 110VDC and even 220VDC input voltages (The different input voltage machine is with different price). If you are not sure which input voltage is suitable for you, you can contact with us directly. 3. Can I replace a MPPT controller to the PWM controller in the machine? Yes, you can inform us when you place the order to us. We can change the controller to you. 4. When the grid is failed, does this machine work or not? 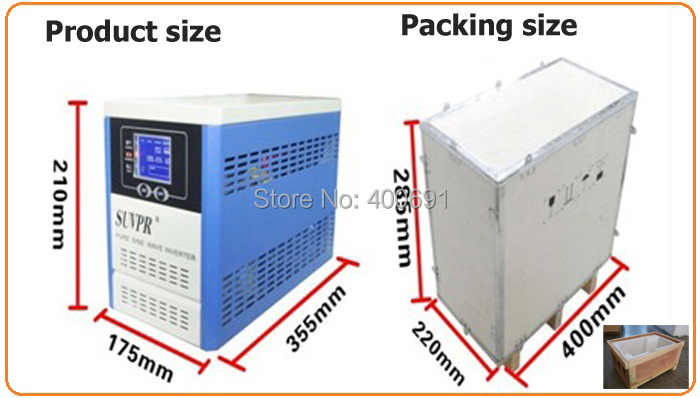 When sunshine is adequate, this machine can still transfer the solar power to supply the appliances working. 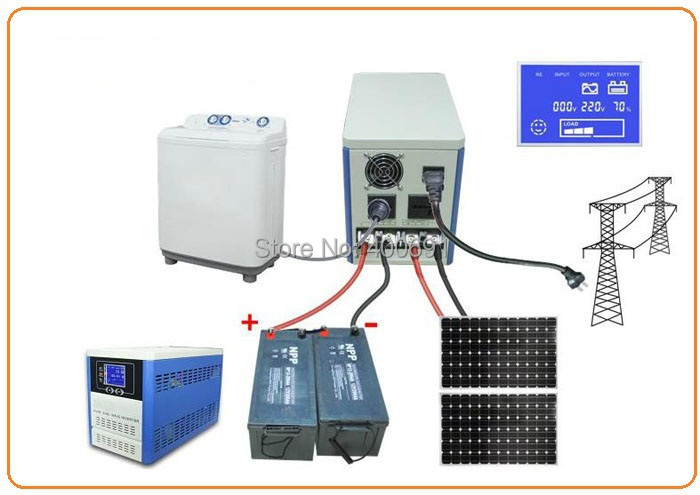 When sunshine is not adequate and the battery is full, machine will transfer the solar power and battery together to supply enough power to the appliances. When sunshine doesn’t exist and the battery is full, the machine will transfer the battery power to supply the appliances. When sunshine doesn’t exist and the battery is lower normal voltage, the battery will stop working. 5. How can I know the machine is working with solar power or grid power? 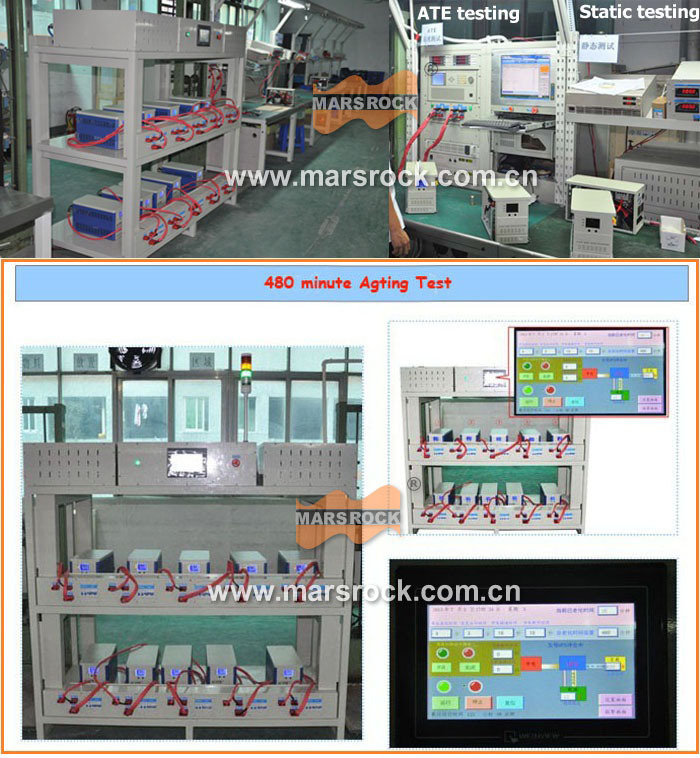 You can check with the LCD multifunction screen on the machine, it can show the status of the machine. 6. Is this machine with communication function? This machine is with an optional RS232 port. If you requires, we can assemble it to you. You can use the port to connect to your computer. If you have other specail questions, don\'t hesitate to contact with us. We are always here to support you. 1. How to calculate the controller circuit which suitable for my off grid system? 2. How to know the batty capacity which i need ? 3. How big power of solar panel which can match with this model controller?